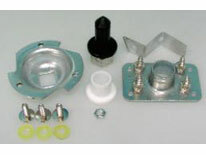 JA WE25X205 (WE25X62) – Dryer rear bearing kit for most GE, RCA & Hotpoint dryers. Kit contains the rear bearing, the bearing housing and a replacement drum shaft. It is commonplace for the drum shaft and bearing housing to be damaged when rear bearing wears out. Mounting location in on back of drum and rear bulkhead. Rear bearing failure can be indicated by loud squeak or squeal. Alternate symptom can be failure of dryer to start after sounding like it is trying to start. Remove drum and visually inspect bearing for wear. Bring your bearing in for free confirmation that it is good/bad or call the U-FIX-IT store for free assistance with diagnosis.